Luxembourg's sports minister has stripped the country's boxing federation of government subsidies after it chose to sanction the proposed heavyweight contest between the unlicensed British fighters David Haye and Dereck Chisora in London in July. Haye and Chisora were involved in a brawl at a news conference following the latter's defeat by Vitali Klitschko, the World Boxing Council title holder, in February. Chisora had his licence withdrawn by the British Boxing Board of Control while the former world champion Haye relinquished his when announcing his retirement in October following his defeat to Wladimir Klitschko last July. 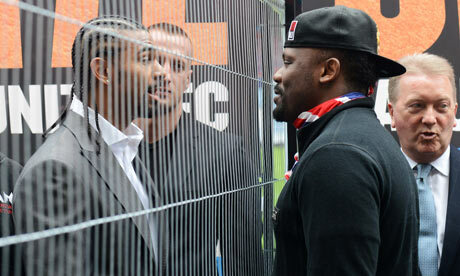 The Zimbabwe-born Chisora was also banned indefinitely by the World Boxing Council. Luxembourg's boxing federation agreed to sanction the fight at West Ham United's Upton Park on 14 July – a move condemned by the BBBC. "The minister was not amused by this initiative," an official at the ministry said on Thursday. "This does nothing to further the value of sport or the image of Luxembourg in general." The official said the subsidies were some €3,000‑€4,000 per year and acknowledged that they would not make a huge difference to the sporting body. "The gesture is more symbolic," he said. The BBBC said this month that anyone involved in the proposed fight would be stripped of their licence. The Luxembourg Boxing Federation has agreed to give both fighters licences and is set to receive Haye for a medical test, which Chisora has already passed. "Chisora had his licence withdrawn, but he hasn't been suspended so he is entitled to seek a licence elsewhere," said Toni Tiberi, the boxing federation's secretary-general. He added that the pair were far from the only boxers to have misbehaved. "You saw incidents with Frazier and Foreman. Tyson bit an ear and was still allowed to box. This fight will be a real match and not one just put on for show."